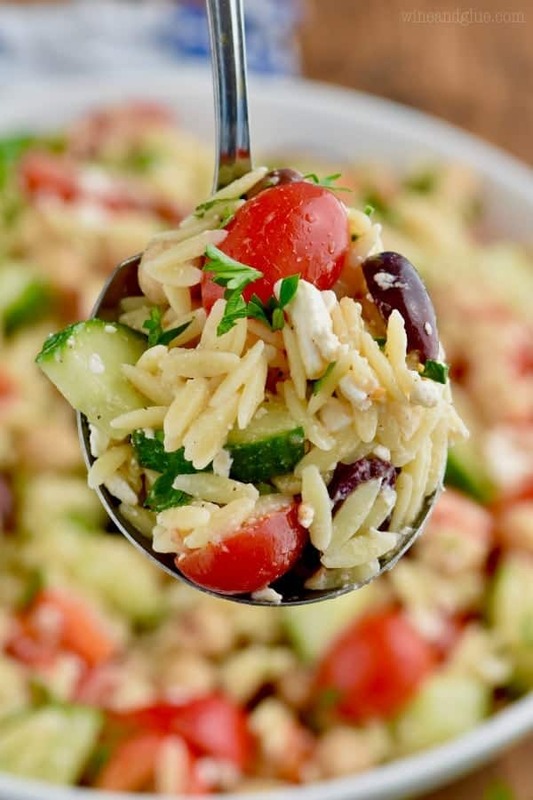 This Easy Orzo Pasta Salad is delicious and combines the perfect flavors in this Mediterranean salad. It makes such a great side dish! I am so excited to be partnering with Jennie-O to bring you this great side dish that pairs perfectly with their turkey burgers! My family loves Jennieo-O and appreciates you supporting the brands that make Wine & Glue possible. So can I tell you guys something kind of amazing . . . . like magical? Gavin has taken up taekwondo. Okay, that’s not the magical part. The magical part is how it has completely changed his demeanor. It’s fair to say that over the last year he has . . . . struggled. Being a kid is hard sometimes. But he has done a 180 in the last two months and it could be a whole slew of things, but I’m pretty sure it’s taekwondo! When he goes they greet each other with a phrase that means, “I can do it!” They have the kids respond with “Yes, sir!” (Or “Yes, Ma’am”) and they teach the kids to do acts of self-discipline, acts of kindness, and respect their parents. But honestly, I think the biggest thing is this fundamental thing they are engraining in the kids, this confidence that they can do things they put their minds to. I love it. Well that, and he’s actually allowed to kick and punch under controlled circumstances and with a purpose. The only thing I don’t particularly love about taekwondo is the fact that we get home AT dinner time. But you realize by now that this is the story of my summer, yes? So I’m loving all things easy these days and because my life revolves around food, the all things easy have to also be all things delicious. 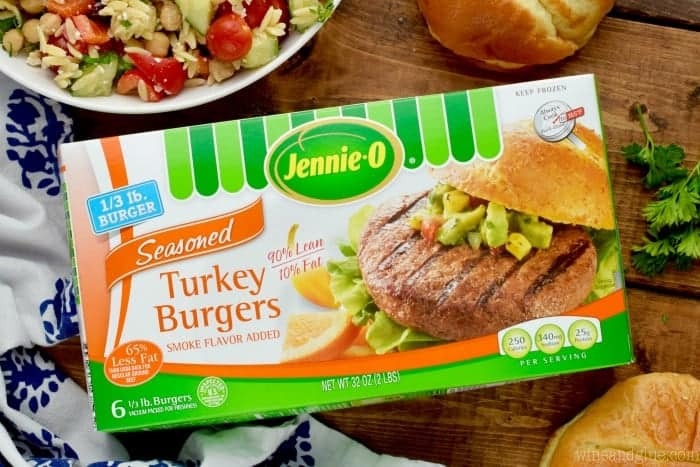 Enter Jennie-O Turkey Burgers! Our family loves Jennie-O products with a firey passion. They are always on our grocery list in abundance. Their sausages show up in our favorite Sausage and Kale Soup, and their deli turkey is in the Italian Pesto Sliders make the internets go crazy. 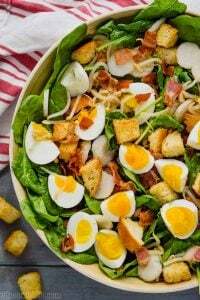 And OMG, their Cajun turkey is flippin’ amazing in this Cajun Cobb Salad. Their turkey burgers are no exception. 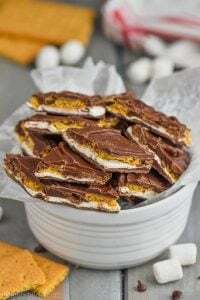 They are frozen individually, which I think is so perfect for a family with a busy schedule. They stay fresh in their little frozen packets, but you can throw them on the grill for a super fast dinner. Plus they are seasoned and totally delicious. 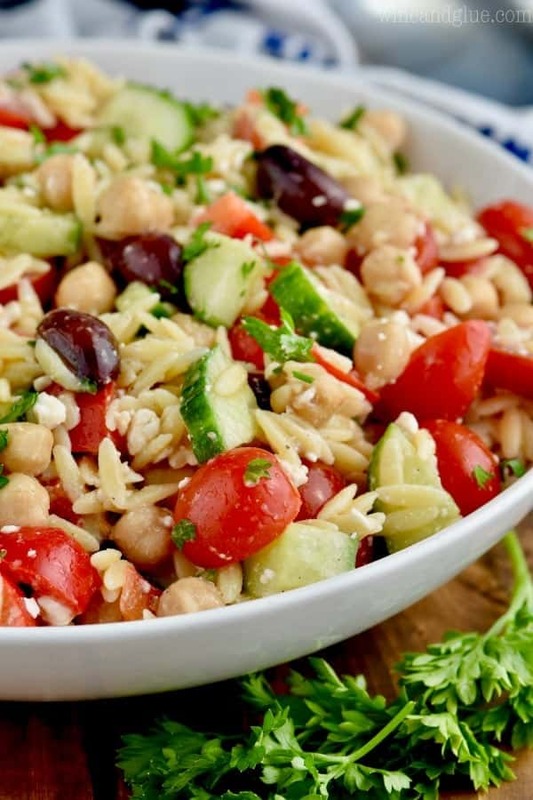 And then you can make this Easy Orzo Pasta Salad ahead of time and serve it up along with your delicious moist burgers! Meal is done and done. Kid is exhausted and happy. And life is good. The flavors in this salad are totally perfect. All the Mediterranean salad flavors you love, topped with a really really simple dressing. The whole salad comes together in about 15 minutes! You can’t beat that. Hit up Jennie-O for great Turkey Burger recipes and follow them on Instagram, Twitter, and Pinterest! 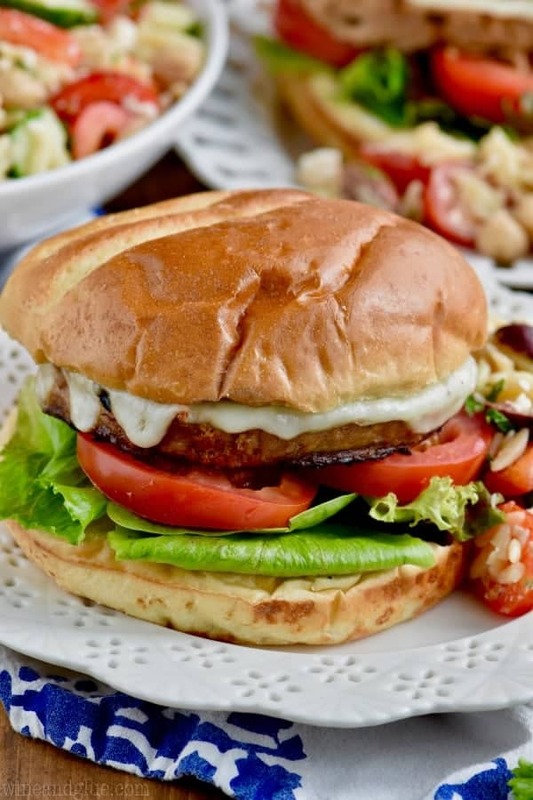 And for even more great recipes using Jennie-O Turkey Burgers, check out Show Me the Yummy’s Turkey Brunch Burger and Food n’ Focus’ Greek Turkey Burger. While the pasta is cooking, chop the vegetables. 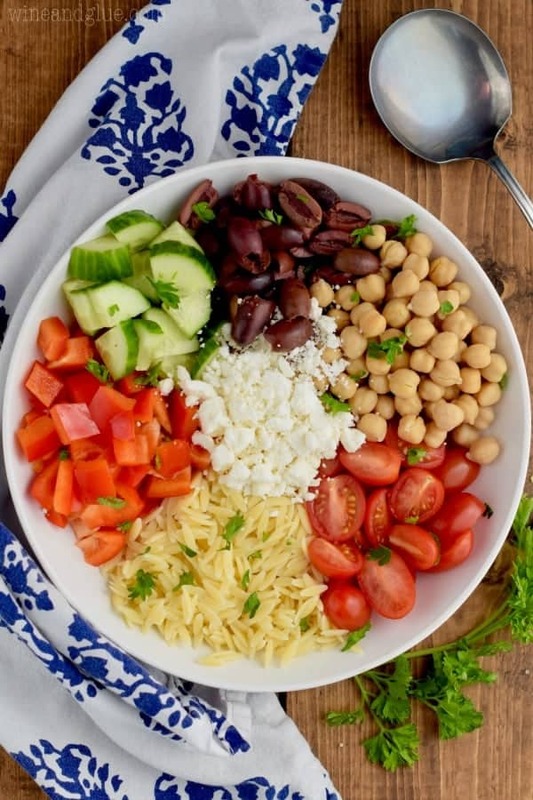 In a large bowl combine the cooked pasta with the vegetables, beans, olives, parsley, and feta. 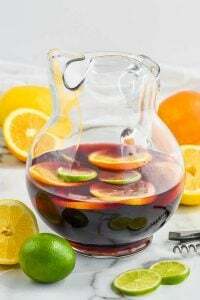 In a small bowl, whisk together the red wine vinegar, olive oil, salt, and pepper. Toss with the salad. Add more salt and pepper to taste. I don’t make orzo often enough and it’s so good! Quick easy dinners after sports practices are also a must, love this! This is my favorite type of food!! Totally my kind of salad – and so perfect with those turkey burgers! 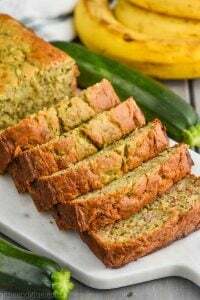 This is a perfect quick summer meal!